This Deluxe Reading/Topper doll was acquired from an antique shop near where the family vacations. 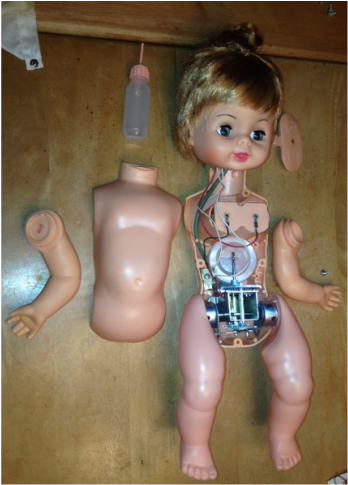 This doll is amazingly complicated. She has a bottle that actuates a switch as well as serving as a drink/wet device. She has two diapers with different shaped contacts that plug into her side to stop her from fussing (kicking her legs and crying). 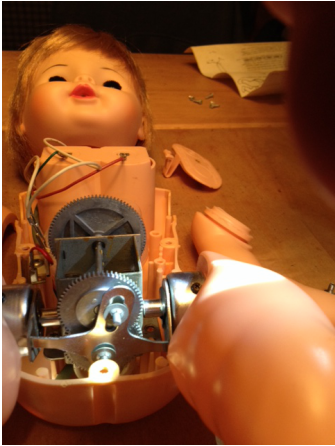 When the doll didn't work from the start, the first step was to unscrew the body panels and check for a seized up motor. Once the motor shaft was lubricated with clock oil and spun a few times by hand it started working. 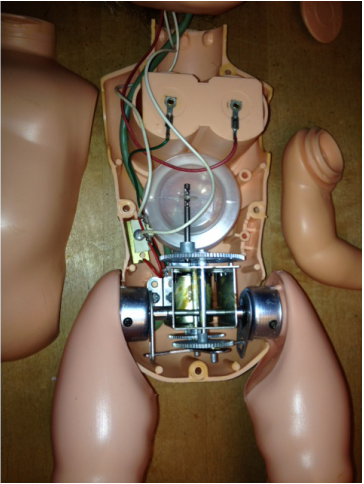 This shot shows the cam assembly that makes the right and left legs alternate going up and down while the doll is fussing. A close-up of the doll's interior. It has an impressive gear box and a bellows. There is also a green tube that connects from the mouth to the wetting hole in her bottom. The white and red wires running into head are connected to the switch in her mouth that is controlled by the long tip of the bottle. The metal plate to the left side of her stomach is where the diaper contacts (one rectangular and one triangular) insert. This view shows how the large gear rotates thereby compressing and expanding the bellows. The bellows creates the "wah, wah" sound of a crying baby.